Since 1935 Bristol’s holdings of drawings and paintings by Edward Bird (1772 – 1819) have included a preparatory sketch for his acclaimed painting ‘The Departure for London’, first exhibited at the Royal Academy in 1815. The sensitive sketch shows a family in their home preparing for their son's imminent departure. 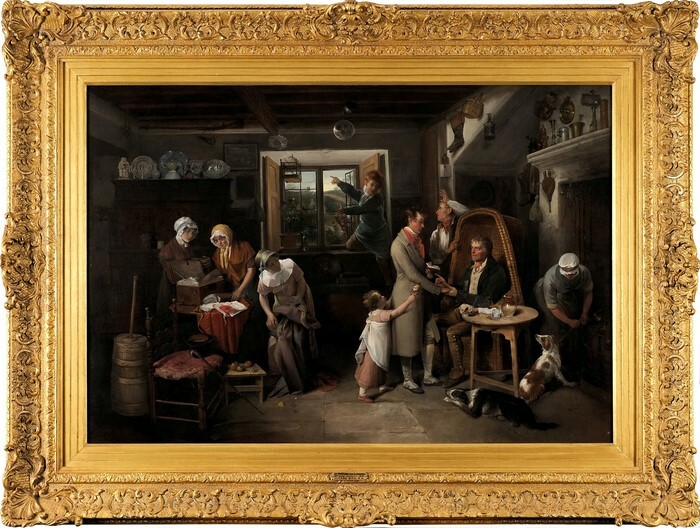 A scene that may remind the viewer of an episode in a Jane Austen novel: two women are packing the young man’s belongings while the elderly father bids farewell to his son, who is leaving to begin his professional life in the capital. A young boy announces the arrival of the coach - seen through a window in the background - with eager gestures. Now we can show beautifully how Bird has developed his composition, how he works as an artist to ensure that his painting and its narrative are balanced, structured and attractive. The young man still bids farewell to his father, who is seated in a wicker chair on the right. But now the father has given his son letters of introduction for his new life in London – the sealing wax on a little table and the inscription on the papers in the young man’s hand are clearly visible. Even more members of the household can be seen in the well-proportioned room, busy to ensure the young man is well prepared for his journey. 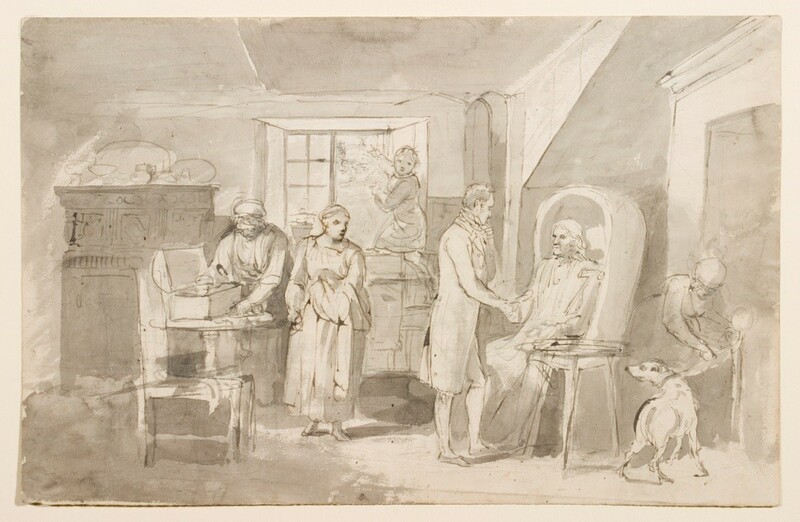 The comparison with the preparatory drawing highlights how Bird adapted his original design to include a small child handing flowers to the young man and another woman helping with the packing of his belongings. If you look closely, the two figures’ skin differs in appearance to that of the other figures – so Bird seems to have taken the decision to include them only when he was already half-way through the painting process. Both figures emotionally intensify the picture’s portrayal of loving family life – a recurring theme in Bird’s œuvre. Also, in the finished painting careful depictions of everyday objects abound and make this already richly narrative picture even more appealing. ‘The Departure for London’ clearly shows Edward Bird’s awareness of the French artist Jean Baptiste Greuze, but also betrays the popularity of 17th century Dutch genre painting in 19th century Britain – and Bristol. It was clear that it should become part of our collection, forming as it does a pendant to ‘The Reading of the Will’, but it was only thanks to the support of the Friends of Bristol Art Gallery we could secure it for Bristol. The painting needs a little conservation work, glazing, and potentially a new frame, but in due course it will go on display in Gallery 7.